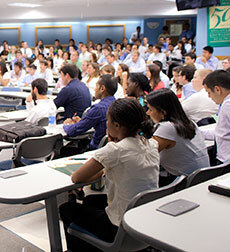 The Master’s of Science in Clinical and Translational Investigation at the University of Miami creates a structured educational program that offers trainees of diverse cultural and educational backgrounds formal graduate training in the principles and practice of translational science and clinical research. This program provides a foundation for the development of future practitioners and leaders of translational science who are prepared to deal with the perceived bottlenecks that inhibit translational research: institutional culture and practice, scientific complexity of translational research design and methodology, and regulatory and ethical processes. The mission of this curriculum development program is to engage promising new and early stage investigators in the discipline of translational science, so that they make the pursuit of academic translational science their own professional goal. Individuals who have completed terminal healthcare degrees (e.g., M.D., Ph.D., DO, RN) who are interested in pursuing additional formal didactic training to become independent investigators in clinical and/or translational science. Individuals who have completed terminal scientific degrees (e.g., Ph.D., DSci) who are interested in pursuing additional formal didactic training to improve knowledge and skills related to translation of basic to clinical applications. Individuals who are currently enrolled in a terminal degree program (e.g., M.D., Ph.D.) who are interested in adding a year to their program to obtain a MCTSI concurrent with their terminal degree. Students who have completed a Bachelor’s degree who have outstanding academic credentials and an interest in obtaining a MS prior to a career in clinical translational research or a graduate program. Visit the Master’s of Science in Clinical and Translational Investigation home page to apply and learn more about the program including admission requirements and costs. Have questions about the program? Email mscti@miami.edu.